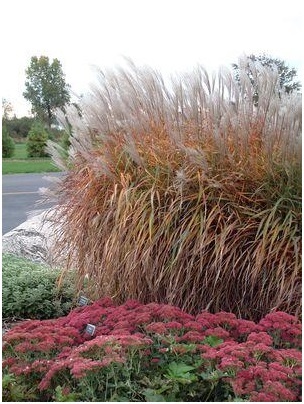 Grasses generally fall into two groups: Cool season, and warm season. Right now is the perfect time to transplant the latter category, the genera that are most active as the thermometer creeps upward. They will reward you with rapid growth as the days become longer and the nights warmer - just the way they like it. Here are a few of our favorites. This classic favorite of gardeners and designers brings a unique regal elegance to the sunny border. There's bound to be a maiden grass made for your needs. Some have solid green blades; some are mixed with red. Others are white-striped, or cross-banded with bright gold. All have impressive plumes and striking fall coloration. Left standing, they grace the winter landscape with structure, sound and movement. Modern selections have elevated this indigenous genus to new heights of garden-worthy beauty without compromising its tough-as-barbed-wire prairie heritage. ■ 'Northwind': One of just three grasses named Perennial Plant of the Year by the Perennial Plant Association, this Midwestern selection is as low-maintenance as can be. This workhorse genus embraces both annual and perennial species. ■ 'Hameln', top-selling staple, anchors the hardy side of the fountain grasses. ■ 'Little Bunny' and 'Burgundy Bunny' are just as cute as their names - perfect for smaller plantings and/or containers.